Lush, dense rainforest cascades down to the Pacific Ocean in Manuel Antonio making this one destination in Costa Rica that you simply must experience by boat. 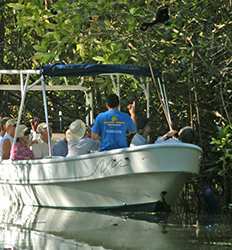 Check out our selection of boat tours in Manuel Antonio and see for yourself. Care to sip cocktails on a private sailboat charter at sunset? 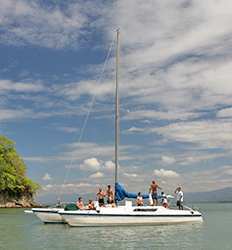 How about snorkeling from a catamaran tour around Manuel Antonio National Park? 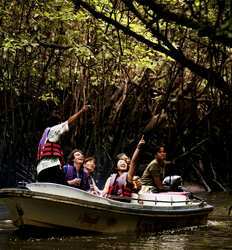 Seeking out nature and wildlife on a safari boat tour in the Damas Mangroves more your speed? Maybe exploring Tortuga Island or Isla San Lucas prison in the Gulf of Nicoya is your dream. Whatever your vacation style, we offer a Manuel Antonio boat tour just for you. 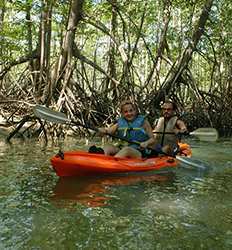 The Real Deal Tours proudly offers da boat tour in Manuel Antonio to fit every vacationer's style and schedule. 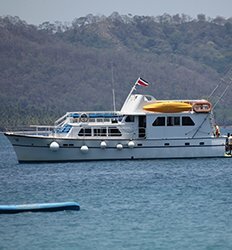 With morning and afternoon departures for our catamaran snorkel tour to a full day of fun aboard our yacht, we can cater to everyone's wants and needs while staying in Manuel Antonio or Quepos. Enjoy delicious lunches and on board entertainment as you cruise around the gentle waters which are perfect for snorkeling. Go explore the history-filled Jesusita & Isla San Lucas Islands or the white sandy beaches of Tortuga Island and know you reveled in your Costa Rica vacation to the fullest! Choose your favorite Manuel Antonio boat tour and sail away with us today! 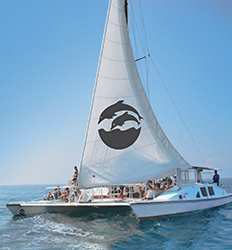 A romantic sunset sail or a great family excursion seeking out dolphins and snorkeling in Biesanz Bay, our 37’ Private Catamaran Charter in Manuel Antonio is exactly what you are looking for! 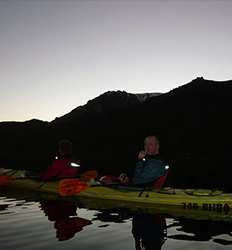 This tour option is for "2 Passengers", for more options see details. 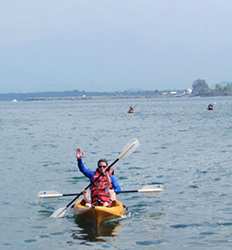 Vacationing in Manuel Antonio and celebrating a special occasion? 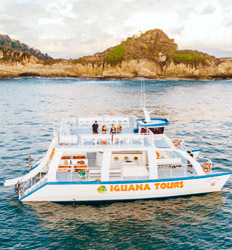 Let our dedicated team makes sure you and up to 40 guests have the time of your life while navigating the coast of the spectacular Manuel Antonio National Park. Looking to host a special occasion or corporate party in Costa Rica? 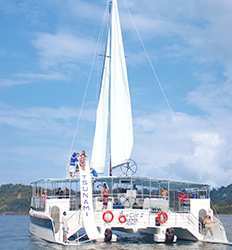 Holding up to 90 pax, our double decker catamaran in Manuel Antonio is the perfect private party boat! This tour option is for "1 To 20 Passengers", for more options see details.